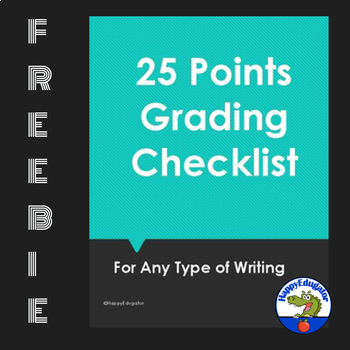 FREE Writing Checklist or Writing Rubric. 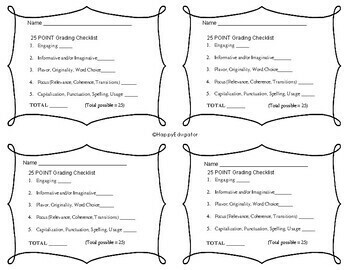 This is a quick and easy writing grader for both teacher and student, and it may be used for creative writing as well as expository writing, or even poetry! There are 5 categories, 5 points each, for a total of 25 points. You need to familiarize your students with the terms first, so that they will have a good understanding of what each section means. I use it for journal writing. I have my middle school students write in their journals daily, and then every two weeks they peer edit, revise and rewrite a favorite journal piece for a grade. 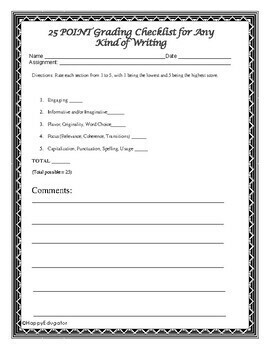 I give them this grader to guide their writing, and they have to have a peer evaluate them and self evaluate before they turn it in. Then it is easy for me to go from there and this is easy to convert to a percentage score as well. This grader is also handy for school writing contests for judging entries.